SLO is a sell order with a pre-set selling price range, i.e. the Stop Loss Price and the Lowest Selling Price, for the stocks you designate. Once the current nominal price of the stocks hits your pre-set Stop Loss Price, your sell order will be placed to the market at the prevailing market price (i.e. sell order is triggered). The Bank will try to process your order but does NOT guarantee that the order will be filled, due to fluctuations in stock price, insufficient market liquidity, system failure or events beyond the control of the Bank. The order may be fully filled, partially filled or unfilled. The filled price may also be HIGHER THAN, EQUAL TO OR LOWER THAN your pre-set Stop Loss Price, but will NOT be LOWER THAN the Lowest Selling Price. Whether it is partially or wholly executed, a Stop Loss Order will lapse upon expiry of the trading day on which it was triggered; it will not be carried forward to next trading day, even if a Good-till date was set. What if the Stop Loss Order (SLO) cannot be executed at the pre-defined Lowest Selling Price? If the order is not filled even at the Lowest Selling Price, such SLO will be converted to an Enhanced Limit Order at the Lowest Selling Price and will be placed to the market for queuing. This Enhanced Limit Order will lapse upon expiry of the trading day whether it is partially or wholly unexecuted on that trading day, and it will not be carried forward to the next trading day. What range for Stop Loss Price and Lowest Selling Price is acceptable to the Bank? Our Bank only accepts a Stop Loss Price set within the range of 11 spreads and 50 spreads (the Bank reserves the right to change the acceptable range for Stop Loss Price without notice) below the current Nominal Price but it must not be lower than HKD0.01. 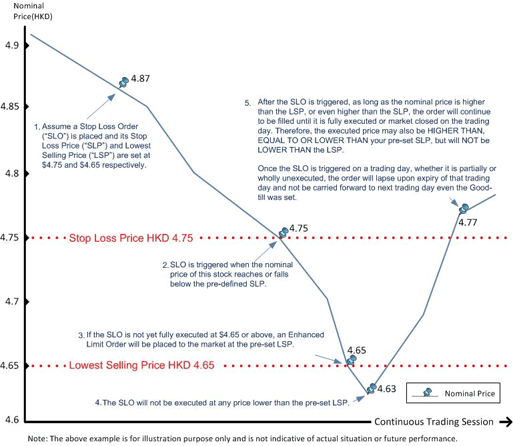 The Lowest Selling Price can be Lower Than or Equal To the Stop Loss Price but it cannot be lower than HKD0.01. We also do not accept any SLO if the current nominal price of such stock is lower than HKD0.02. Can I amend a Stop Loss Order (SLO)? A SLO cannot be amended. However, if a SLO is still pending for execution, you can cancel the order first. After the order is cancelled, you can place a new order again. Only outstanding SLO can be cancelled.